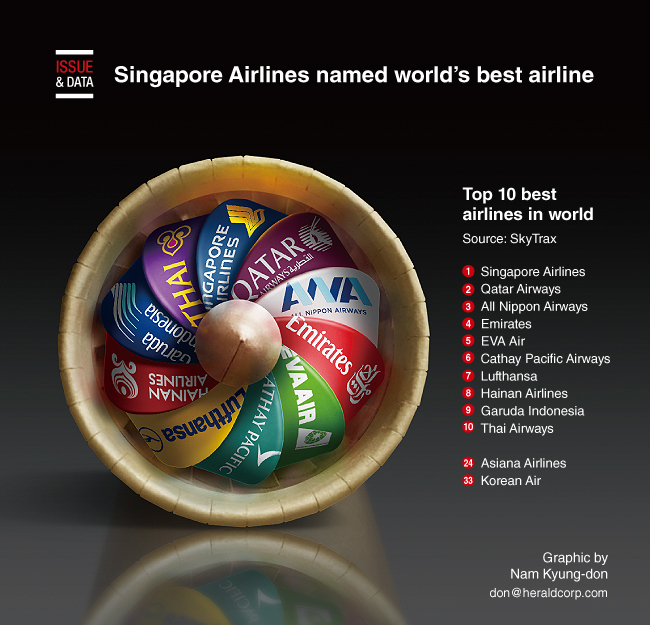 Singapore Airlines was named the best carrier in the world, according to SkyTrax, which surveys more than 20 million fliers every year. It was also named the best in first-class. This is the fourth time the Asian company has won the honors since the annual award was established in 1999. East and Southeast Asian carriers dominated the list with seven among the world's top 10 airlines this year, including All Nippon Airways and Cathay Pacific Airways. Gulf-based Qatar Airways and Emirates took the 2nd and 4th spots. Deutsche Lufthansa was the only European airline to make it to the top 10, while there were none from the US. South Korea's two major airlines Asiana Airlines and Korean Air ranked 24th and 33rd.